The Nature Fix by Florence Williams published by W.W. Norton & Company in 2017 provides the most compelling argument to date for people to spend more time outdoors in nature, based on an increasing amount of biological, psychological, and medicinal scientific evidence. Over the years, efforts have been made to quantify nature’s impact on mood, well being, ability to think (remember, plan, create) and sociability. The biophilic hypothesis involves lowering human stress, boosting mental health, restoring attention, empathy, and cognitive clarity. Nature also effects a social component like the feeling that is shared among people who spend time together outdoors or people who perform exceeding acts of kindness in the aftermath of a severe environmental event such as a tornado, earthquake, firestorm, and such. The top of the pyramid would include yearly or biyearly wilderness multi-day trips. More significantly, such wilderness experiences are invaluable for adolescents or following grief or trauma. The author traveled the world over to investigate and experience research on nature’s impact on humans. In Japan she saw “forest bathing” on a sensory walk in the woods on one of the 48 forest therapy trails in the country. In Scotland they call it “eco therapy.” In 2008, Richard Louv coined the infliction “nature deficit disorder” in his book “Last Child in the Woods” and he called for getting kids into the outdoors more often. The leading cause of the decline of kids getting outdoors interestingly is parent concern about stranger danger more than their kids' addiction to technology screens! The evidence (20 pages of cited notes and credits) about nature impact involves details with cortisol levels, sympathetic nerve activity, heart rate decline, and hemoglobin in the brain’s prefrontal cortex. The book is replete with that type of information, but obviously the average person may not be very familiar with such neurological details. In South Korea, Williams learned of antibacterial compounds associated with soil and the smell in nature known as photoncides, pinene, and turpene. She met with a Korean professor of “social forestry” who introduced her to the world’s only college degree for forest healing. In South Korea from 2010-2013, visits to the forest increased from 9.4 million to 12.7 million, while in the USA there was a decline of 25% during the same time period. One of nature’s benefits are delivered through sound – a bubbling brook, bird tweets in the early morning, the leaves moving in the wind, and so on. But the US Park Service claims that 83% of land in the lower 48 states sits within 3,500 feet of a road and that within 20 years 90% of the population will be close enough to hear at least one of the projected 30,000 airplane flights per day…let alone noise associated with auto and truck traffic, lawnmowers, leaf blowers, etc. In Seoul, South Korea, $380 million was spent to create a 3-mile, 20-foot wide creek with water, shrubs, and trees to address the urban soundscape and provide a nature corridor within the city. Williams cites studies of the positive effect of windows in schools, offices, and housing on productivity, stress, higher academic test scores and grades, and lower levels of aggression. In Finland, 95% of the population spends time recreating outdoors and 50% ride bicycles and it is easy to access forests because 74% of the country is covered by trees. There are 2 million summer cottages for a population of 5 million Finns. And the Finns correlate this focus on nature to reduced health care costs and improved mental health and physical fitness. The Finnish prescription to get in nature is a minimum of 5-10 hours a month, 30 minutes on 5 days per week, or 2-3 days outside the city per month. Scotland has a National Walking Strategy incorporating government guidelines for what it calls the “Dear Green Place” with a goal of having access to safe woodlands within 500 meters of people’s doorsteps. A 12-week Scottish outdoor program called Branching Out is intended to provide better mental health for 3 hours per week to reduce symptoms of depression, increase sociability, physical exercise, and self-esteem. This is adventure therapy and in a test of 700 participants who were former depressives, addicts, or petty criminals more than 70% went on to find permanent employment. A study at Stanford University showed that getting out in nature can impact rumination, where we replay unpleasant thoughts over and over. Rumination is linked to anxiety and depression and the brain portion that is impacted is the subgenual prefrontal cortex, which is generally linked to sadness, withdrawal, and grumpiness. Williams visited Singapore, which practices “urban naturizing” where half of the 276 square miles of the city have some type of green cover so that some say it is a “city in a garden.” Seventy percent of the population in Singapore lives within 400 meters of green space. The government in Singapore allocates .6% of the national budget to develop scenery and greenery. 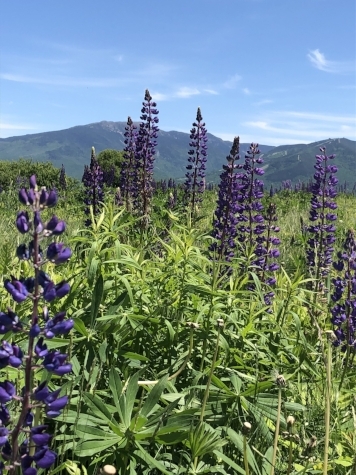 There are successful nature programs to help people who suffer with PTSD (post-traumatic stress disorder) and ADHD (attention deficit hyperactivity disorder). While some agencies do not recognize wilderness programs as a legitimate healing tool, Outward Bound did a study on a therapeutic adventure program showing 9-19% of participating veterans who had PTSD, improved. Williams includes a discussion about ADHD programs where 6.4 million kids are diagnosed and half of them are taking medication for the malady. The digital age is profoundly narrowing our horizons and physiological capabilities but ADHD may have existed and been an unknown issue before electronics. Famous people such as Mark Twain, Ansel Adams, John Muir, and Frederick Law Olmsted all had problems at school but they found enough relief out in nature to become luminaries in their fields (all related to nature). Speaking of school, Williams discusses education outdoors stating that Frederick Frobel created the concept of “kindergarten” (children in the garden?) in 1837 so that kids can absorb the natural world through their senses. Over the years more indoors activity and academic work had been incorporated into kindergarten education. American students are outdoors less frequently and the National Trust Report showed that outdoor activities declined 15% among 6-12 year olds between 2006-2014 and the radius of activity around the home where kids can play declined by nearly 90%. But on a positive note, there are an increasing number of elementary schools that are incorporating “Forest Friday” type programs into the weekly activities. A therapist in Minneapolis gives her clients the option to take their therapy sessions while walking outside at a park that is a block from her office. Tammie Rosenbloom of Minnetonka Counseling is the practitioner who says she gives the same treatment while walking or in the office, but she’s noticed during the walking therapy that her understanding of the clients is enhanced. “It’s meditative to walk and it’s a rhythm.” In the winter, she uses handwarmers and offers them to the clients. She also says she’s willing to participate in activities such as cross country skiing or paddleboarding during sessions with clients. Isn’t it about time that more therapists, doctors, teachers, and parents prescribe getting outdoors more often? Those familiar with everything Vermont will recognize McKibben’s local geographical and sociological references and that is an essential element of the overall point. Among the 16 books produced by McKibben, starting with “The End of Nature” and more recently with “The Global Warming Reader,” he has previously written about cross country skiing (Long Distance) and in real life he is a regular patron at Rikert Nordic Center near Middlebury, Vermont. Outdoor enthusiasts will enjoy the way McKibben weaves the sport of cross country skiing into the story using biathlon (competition that incorporates target shooting with cross country skiing), and an ambush, rescue, and escape on cross country skis. Some of the stand-out quotes in Radio Free Vermont include “the sound of freedom is low, quiet small. It doesn’t drown out everything else,” “Federal and state officials are not terrorists, they’re mostly just in over their heads,” and Rex Tillerson, US Secretary of State and one time Exxon CEO said to the fictitious Vermont governor, “I want to say that I’ve never had the chance to visit Vermont due to the fact that you have no deposits of oil or natural gas, but I do know that you have a number of very fine filling stations.” The use of humor can be poignant and stinging. The book is a quick read and leaves you wondering about greed and politics. Vermont’s real governor recently outlined his idea to conduct a targeted marketing campaign to attract selected people to come and populate Vermont because the state population continues to decline while the cost of living keeps escalating. Due to the state’s economic shortcomings and political polarization it is unlikely agreement can be found on issues related to Radio Free Vermont such as developing a carbon tax or universal health insurance…let alone secession [sic]. I've often wondered why there isn't more hoopla about cross country skiwear. I'm not talking about the suction suits worn by the cross country ski racers; I'm referring to the recreational garb, which is versatile, functional, and fashionable. Currently, I cross country ski wearing items from Craft, Sporthill, Swix, and others, but what is important is that the products that I select to ski in fit a number of personal parameter preferences. Of course, skiers need to heed the weather by wearing layers (base layer underwear, pants and tops, and outerwear) and when its colder, thicker layers are necessary. The Craft AXC Touring Pants that I wear have zippers along the entire length of the legs and at the ankle there is an elastic area closed with a zipper and a snap. I feel that this pant ankle set-up is the most significant aspect of the pants because it tightly fits around the boot and keeps snow out of the shoe top to avoid getting wet socks while skiing. And if you've ever lost a set of keys, the zippered side pockets are comforting to lock away your valuables. The comfortable lined material of the Craft pants is also enough to stay warm with or without a base layer underneath. There are other pants that I use that are lighter and have similar accoutrements. Sporthill, Craft and Swix jackets have most everything I want in a jacket, except few have pit zips to provide an extra way to cool off and transport perspiration away. These jackets have a mesh liner and material that are comfortable when you have to zip up the collar on a very cold day. I've used the packable hood on the jacket quite a few times when it suddenly got cold out on the trail, and it was a valuable asset. The high-hip fit keeps you warm and the zipper side pockets can be closed to avoid losing pocketed items. The jacket arms might have extended fleece cuffs, which are a nice touch to keep snow out of your glove. The inside chest pocket has a zipper and a hole for an IPod and earbuds for the times that I want musical accompaniment on solo trail outings. Socks, gloves, shirts, and base layers are an entirely other matter that will need to be covered in a separate article. In short, parameters for selecting socks include thickness, spacious comfort for your toes, and height of the sock on your leg. Expect to pay as much as $25 for quality socks these days. I have a few different pairs of gloves so I can adjust to the temperature ranging from heavier insulated three-fingered gloves for the really cold days to lightweight gloves for springtime. I also have baselayers in various thicknesses to correlate to warm and cold days. Moving perspiration away from the body is very important and I use very lightweight underwear on those nice winter or spring days, but on the coldest days I use a heavier or thicker baselayer pants and a top that has a turtleneck. Former Director of Research Kelly Davis at SIA (national trade association) says that there are three different demographic types who purchase snow sports apparel as casual wear, and her synopsis fits the cross country ski apparel market very well. The "urban woodsman" is a hip male style that touts outdoor authenticity. The "young urban male" is an athletic-influenced style, and women especially in the suburbs are buying snow sports styles for around town and even work. Further, Davis cites that 80% of snow sports apparel spending comes out of women's wallets. They make decisions for the whole family, so it is important for manufacturers, product designers, and retailers to consider and focus on women's preferences. One of the challenges that confronts cross country skiing apparel availability is the fact that there is such a limited inventory of these products in retail outlets. There are too few sales in the stores, and retailers react by purchasing fewer items offering less selection in the following year. To break this cycle, we've got to go out and purchase more cross country skiing apparel! Fresh winter air and outdoors in nature, where fun and fitness come together. Step on your cross country (XC) skis and go. You want good glide on the flat terrain, effective grip going up hills, and controlled turns down the hills. The XC ski equipment and clothing is designed for skiing on groomed trails or in the snow covered untracked terrain; for sunny days in fresh powder or whiteout snowstorms in freezing temperatures. 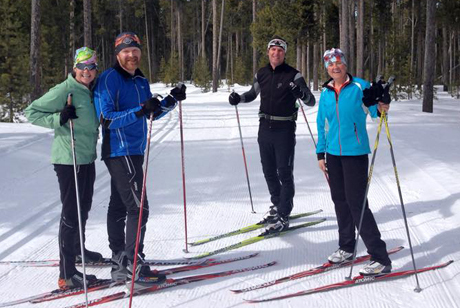 With regard to gear, there are many factors to make or break the XC ski experience. XC skis for example provide varied width, flex, and edges, all designed to perform optimally in different XC skiing conditions. Every year, ski magazines and websites deliver their annual gear review with a focus on what's new for the XC ski expert or racer. It is thought that the technology used in these products geared to advanced skiers will "trickle down" to be incorporated and become beneficial to recreational skiers in the future…well, XCSkiResorts.com wants to provide a view specifically for recreational interests, to look at select products that offer a great experience XC skiing. To address the lifestyle interest in XC skiing, there are more progressive colors being introduced by the clothing suppliers. Bright colors as well as muted color ranges are becoming more mainstream with neon highlights. Waxless technology continues to be refined for better performance across the classic ski product range eliminating the need for kick wax, streamlining the pre-ski process and get on the snow quicker. XC SKIS: Rossignol touring skis within their EVO category are compact skis that are easier to maneuver, transport, kick, etc. EVO skis are also a bit wider to feel more stable in softer snow. 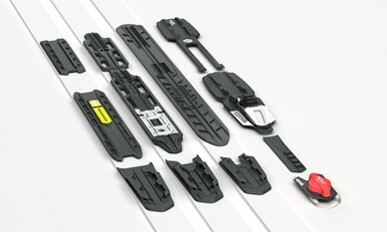 There are two levels of EVO skis designed around how much someone will use the equipment. The EVO Trail, Tour and Action are designed for skiing more frequently, which could be in different snow conditions – new, old/glazed, unconsolidated, etc – which impacts how the pattern will grip in the snow. With these three models, the Positrack waxless pattern gives excellent grip in varied snow conditions. The ski cap construction allows a bit of an edge where it meets the base and this adds grip and confidence when snowplowing and getting around turns. The EVO Glade and First are designed for skiers that may not plan on skiing on a regular basis but would like to have some skis on hand. A cut pattern in the base for grip works great in many snow conditions, but it does not have the same range as the Positrack base. The construction changes from cap to sidewall with the Glade and First and that change does not allow for the slight edge that is in the cap construction. Glades and First are great skis for ski areas with prepared tracks, golf courses or open meadows and the Trail, Tour and Action will be more dynamic on snow and have increased versatility. With the EVO skis, it's easy for skiers to choose their model determined by the level of use or performance to suit the skier's needs. The ski width would be based on where they'll be skied and how much floatation is needed. The Spider 62 is Fischer Nordic's most popular ski for a variety of uses including machine-groomed tracks at the ski area, in man-made tracks, or on unmaintained terrain. The Spider is available in three sizes, has a steel edge for control, and a base pattern that holds going uphill. A few years ago, Fischer XC introduced the NORDIC CRUISING line of skis. The unique shape and look of these skis help you understand the benefits and simple, but effective logic behind this series. Fischer's Wide Body Technology (WBT) is the original concept behind Nordic Cruising, and is responsible for the stability and grip features. The shape creates a ski that is noticeably wider under foot with a narrowing in the forward and tail sections. Nordic Cruising sidecuts are defined by 3 measurements. The Cruiser series features a wider waist, which provides control and stability by allowing more pattern contact with the snow to improve uphill grip without reducing glide. The Alpina Sports Corporation's Control 64 Edge ski is for tracked or untracked terrain with a ¾ steel edge (is only on about three quarters of the ski edge rather than fully tip to tail) for better gliding. There's a waxless base and good flex on the ski so it is great for shuffling skiers and those who want more downhill control. XC SKI BOOTS: The biggest change in XC skiing is that the ski boots are built for support, comfort, and warmth. For recreational touring boots, Fischer has 5 men's models and 5 women's models to address different fit, performance, and pricing needs. Fischer's models of boots are available in a men's or women's fit. There are differences between a male and female foot, which are addressed in the last of the boots. There's Thinsulate insulation in the boots and the women's boots have a fleece lining to provide increased warmth. Similar to skis where use will help determine the model, boot models can also be determined by increased support or warmth. Alpina Sports has the T40 boot that includes a supportive cuff and counter system for support and a better sole to prevent slippery walking. The T30 version of the boot for women has the same features but is lasted for a woman's foot with more curvature, narrower heel, and a rounder toe box. Alpina's T30 also has a plush liner inside the boot and Thinsulate insulation where needed for warmth. XC SKI CLOTHING: Sporthill's Super XC versatile medium-weight pant crosses a wide spectrum of temperatures and weather conditions. Perfect for both running and Nordic skiing, the slim fitting, low profile Super XC features front panels that are made of Windshield, a water-repellent stretch knit softshell that sheds water, breathes, and blocks the wind. The back panels are made from SportHill's soft, stretchy SwiftPro fabric which allows the pant to wick moisture from the inside out. The articulated knee overlaps a stretch panel built in for extraordinary mobility. Ankle zippers reveal an inner gusset, so unzipping allows hem to go over a wider boot without exposure. For comfort, fit and convenience, the Super XC also has a contoured elastic waistband with a draw cord and a back zippered pocket. The Craft AXC Touring Pant has zippers along the entire length of the legs and at the ankle there is an elastic area closed with a zipper and a snap. This pant ankle set up is the most significant aspect of the pants because it tightly fits around the boot and keeps snow out of the shoe top to avoid getting wet socks while skiing. And if you've ever lost a set of keys, the zippered side pockets are comforting to lock away your valuables. The comfortable lined material of the Craft pants is also enough to stay warm with or without a base layer underneath. The Sporthill Symmetry II Jacket has everything you might want in a jacket except pit zips to provide an extra way to cool off and transport perspiration away. The jacket's mesh liner and material are comfortable when you have to zip up the collar on a very cold day. The packable hood on the jacket is a valuable asset in frigid temperatures or when it suddenly gets cold out on the trail. The high-hip fit keeps you warm and the zipper side pockets can be closed to avoid losing pocketed items. The jacket arms have extended fleece cuffs, which are a nice touch to keep snow out of your glove. The inside chest pocket has a zipper and a hole for an IPod and earbuds for the times that you want musical accompaniment on solo trail outings. The Sporthill Women's SwiftPro Zip Top is a jacket that follows the contours of the body with flattering chafe-free seam lines that form the underarm gussets and side panels. It has a shaped body hem with a slight drop tail to help keep the cold out. This quick-wicking, breathable top has special touches like a zippered key pocket on the left front hem, and curved, built-in thumbholes as well as inner mitts. The fabric's stretchy comfort and ability to block the wind (up to 25 mph) are good characteristics. The 13-inch front zipper helps regulate your temperature and the zipper features a storm-guard at the top and reflectivity at its base. The SwiftPro Zip Top is embossed with a snowflake pattern that makes this high performance top fun and feminine and it can be worn alone or as a base layer under a jacket. Socks and Gloves: Folks at Darn Tough, one of the hottest brands at the moment say look for a form fitting performance sock in a micro crew height (that means that it will come up just to the top of your boots), ensuring maximum comfort and support. Depending on the fit and comfort of your boots you might want either a minimalist lightweight pair or one with some light cushioning, but any pair of socks for XC skiing should have seamless toe construction to prevent bunching and pressure points in your boots. You want a reinforced heel and toe and some elastic around the arch for miles of blister-free bliss. Merino wool socks (actually, Nylon and Spandex are in the socks, too) are especially good for high output winter activities like XC skiing thanks to their many natural attributes. Merino wool socks are breathable, non itchy, wick moisture away from the skin of your foot so that you won't feel clammy, stay warm even when wet, don't rub and won't cause blisters! On top of all that they are naturally thermo-regulating, which means they will adapt to your body temperature because Merino sheep live in extreme climates so their wool has evolved to work equally well in hot and cold environments. Merino wool socks can be machine-washed on a warm cycle and then thrown in the dryer with the rest of your load, although Merino wool socks are naturally anti-microbial (no stink) so you can always wear them for another workout if needed. There are plenty of other great sock producers but a really cool thing about Darn Tough is that there is an unconditional lifetime guarantee – no strings attached! The Yoko Convertible glove has a pull out waterproof and windproof cover (hence the name). This versatile glove is perfect for cycling commuters, back country skiers, and for those who want the flexibility this glove offers. Different pairs of gloves are needed to correspond to various temperatures, so more insulation is needed for extreme cold. Additionally, it is useful for the glove to be reinforced in the areas that grip the pole and have some cuff method to shut out cold air and snow. So there you have it, a few name brands and products along with some tips for the recreational XC skier. Now get out there before the winter ends! Roller skiing, the non-snow equivalent of cross country skiing, was developed as early as the 1930s and it was used as a way to train for cross country ski racing as early as the 1950s. Today roller skiing is a low-impact high-intensity workout that is a full body exercise and easy on the knees. 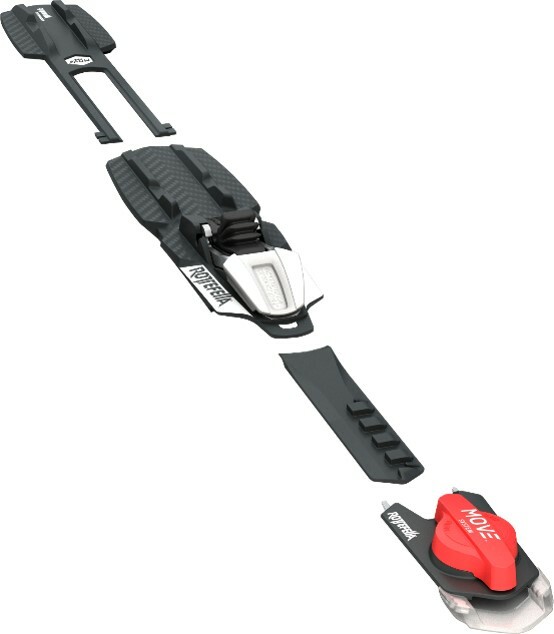 Roller ski gear uses short skis on wheels with mounted bindings that enable a cross country ski boot to connect. Factors in selecting roller skis include durability, smoothness of the ride, matching skier ability, the road condition and the type of training that is desired. There are different products for classic and skate roller skiing and prices for skis range from $99 - $500. Roller skis are much improved compared to the old products. Cami Thompson Graves, head women's Nordic Ski Team at Dartmouth College stated that "roller skis closely simulate cross country skiing, especially skate skiing." A local retailer commented that "after the last winter Olympics, there was a worldwide recreational enthusiasm for roller skiing." He also said that the fastest growing region for product sales is the American Sunbelt. There are more than 50 roller ski models for different uses available for every budget and ability level. Roller ski enthusiasts are mostly cross country skiers who want to continue training after the snow melts. Classic roller skis usually use wider small diameter wheels while skate ski wheels would have narrow large diameters. The difference involves speed, wear ability, handling rough road conditions (cracks or debris), and getting a similar feel to skiing. Roller ski construction involves weight, flex, and durability and are available in aluminum, wood, or composite materials. Softer and wider wheels provide a smoother and slower ride. Hard wheels will be faster but can vibrate excessively on rough pavement. Ski poles have rubberized tips that resist slipping when planted on pavement rather than the metal tips used to dig into snow. Accessories are available for speed reducers and brakes to control speed on steep downhills, but not all models are compatible for adding them. According to Coach Thompson Graves, "for safety on the pavement, it is important to wear helmets and high visibility clothing and be aware of the road conditions particularly at the bottom of hills." Using the simple premise that women's products need to be different from men's, some cross country (XC) ski companies went to work designing lines of women's skis and boots that incorporate various differences between the male and female physical characteristics and their interests. For example, women generally have narrower feet, so companies have built boots to accommodate this difference. A woman's whole center of gravity may be shifted compared to a man, which means that application of force from the legs to the skis is shifted, so different flexes in a ski are appropriate. Some product differences are cosmetic (feminine colors) but they can also address fundamental interests such as stability or downhill control. Moreover, they are not just for the touring lines—companies recognize the need for women's products in each equipment category, from touring to backcountry to performance and racing. Jan Guenther owner of Gear West, a retail dealer in the Minneapolis area commented that women are often shorter and lighter than men so they might be matched to a ski with a shorter length or softer flex that corresponds to their ability and skiing goals. Alpina Sports designed a line of women's XC ski boots after analyzing 2,500 women's feet using a patented Optical Measurement System and 3D Scanner to arrive at the "ideal" proportions. The fit of the Alpina's women's boots is dramatically different than the typical men's - women are often sold differently lasted and smaller sized boots. The flex patterns are totally altered, the heel pockets are much narrower, and the cuffs are redesigned for the slightly different calf/ankle configuration of a woman. Leading brand Fischer is making a big splash with its women's XC line of skis and boots referred to as the My Style collection. The skis have a stable platform and excellent grip and the package includes color-coordinated skis, boots, poles, and a ski bag. The skis with names such as Inspire, Mystique, Desire, and Passion include a Fashion product line and the Sport line option. These skis are configured lower than their unisex counterpart to account for lighter body weights and designed for the classic technique with less effort required. The ski camber is adjusted to a lower height (from the floor or snow) so it will accommodate the skier who can use less energy to get the ski base waxless grip pattern on to the snow. And there's a new specially developed, very light binding for fitness-oriented women that is very user-friendly with an automatic step in/out mechanism. Mariah Frye-Colie of Cross Country Ski Headquarters, a Michigan cross country ski retail and area operation commented, "Women like to feel good with product options that flatter a women's body, but also are functional and comfortable. The Nordic ski manufacturers have woken up to the demand and it's great to have more feminine equipment and clothing." Photos: Fischer My Style XC Comfort Pro My Style Boot and Fischer Spirit Crown My Style Ski. For women's XC ski and snowshoe event listings click the Women's Page. About half of all snowshoers are women, who snowshoe to experience nature, to exercise with friends and family, for backcountry access, and to have outdoor fun throughout the winter. The various snowshoe companies have been catering to this market by offering a broad selection of women's-specific snowshoe technologies recreation and fitness, but do the women's snowshoes go beyond just a change in cosmetics? Tubbs Snowshoes pioneered the development of women's-specific snowshoes by offering patented binding technologies that custom fit women's boot sizes and by ergonomically engineering frames that are tapered at the tip and tail to accommodate women's shorter strides. The result was lightweight, comfortable, high-performance snowshoes and many of the other brands have followed suit. There are a few differences between Tubbs' men's and women's snowshoes. 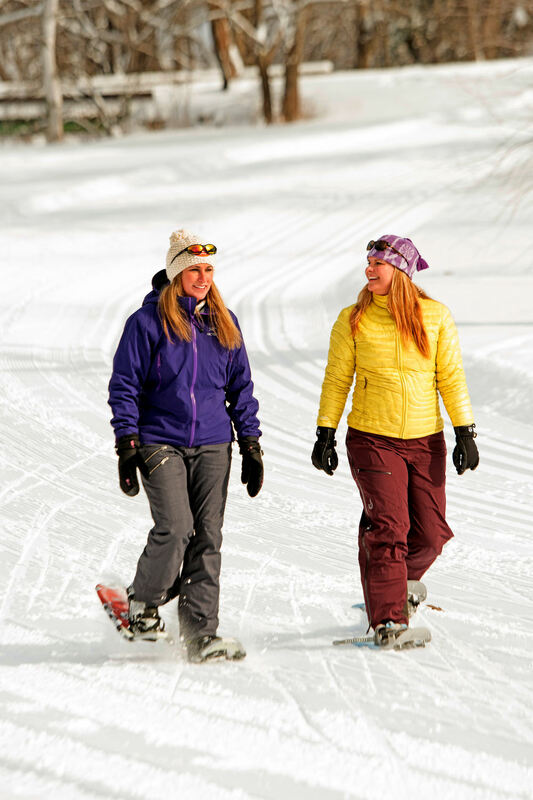 On average, women have a narrower stance and shorter gait, so women's snowshoes are narrower in width. Women's average weight range is both more light weight and a smaller range than men's, so they provide snowshoes in a shorter size for women, longer for men. The Tubbs men's and women's bindings differ, providing the optimal fit for the average women's boot size and volume range, versus a larger average men's boot size and volume range. Foot size also affects the optimal position for the heel lift, so the placement of the heel lift on men's snowshoes varies from the placement on women's snowshoes. The Atlas Snowshoes Company conducted gait studies and biomechanics research to create snowshoes that enable women to hike and run with the most natural stride possible, while making the snowshoes both comfortable and lightweight. The research revealed that women have a greater Q-angle (at the knee where the thigh bone angles in from a woman's wider hips) and abducted gait that create specific issues when snowshoeing. Women also tend to pronate (collapsing arches) pointing to the need for bindings to support the arch of the foot. According to the people at MSR, the studies conducted by Tubbs clearly showed male/female anatomical differences. However, when these differences are translated into physical products the design changes are not as noticeable. For example, women generally walk with a narrower gait than men. Therefore, a very narrow snowshoe would suit women better, but the snowshoe width has a direct impact on flotation so the final design can't be too narrow. The ideal width snowshoe for women is a balance between very narrow to accommodate gait and wider for adequate flotation. MSR believes that it is important to look beyond the measurements and understand how the snowshoes feel. Thousands of hours of field testing showed that subtle differences are noticeable. The major male/female differences with men's and women's versions of MSR are with decks and bindings. The women's deck shape is optimized for snowshoe performance (traction & flotation) and a female gait. The bindings are sized to meet the proportions of a women's footwear. There is also specific MSR technology such as Axis™ Gait Technology (Women's Lightning Ascent Snowshoes), which allows women to compensate for varying degrees of toe-out or toe-in. This technology provides laterally adjusting the bindings independently of the frame, ensuring efficient, parallel-tracking snowshoes regardless of a women's natural toe-out or toe-in stance. This means that the binding itself can swivel on the snowshoe to adjust for varying degrees of natural toe direction allowing binding alignment with your natural stance rather than forcing you to point your feet directly ahead. Yukon Charlies Snowshoes has the YC Pro II Series women's snowshoes, which are designed with features specific to the needs of the female snowshoe enthusiast. The rockered V shape tail enhances performance and allows for a more natural stride. These snowshoes are lighter, stronger and more reactive than any of the company's other women's snowshoes. Yukon Charlies's Advanced Series for women is a feature-packed "go anywhere" snowshoe is designed by women, for women. The rocker V tail allows for a natural stride from a walk to an aerobic sprint, while the integrated heel lift and the axle system makes Yukon Charlie tout them as their best women's snowshoe ever. Redfeather Snowshoes has three styles of Hike snowshoes with the SV2 pull handle binding. There's also a choice to get the snowshoes in a kit with poles and a bag. The Redfeather Hike has sizes of 22, 25, 30 (inches) for women up to 150, 175, and 200 lbs. Tubbs Snowshoes and Atlas Snowshoes have shown the greatest commitment to women's snowshoe products and they are probably the largest snowshoeing product brands. Tubbs Snowshoes has 11 models for women (in seemingly every snowshoe category) including Flex ESC, Flex TRK, Flex ALP, Flex RDG, Flex Vrt, Wilderness, Mountaineer, Frontier, XPlore, and Xpedition. Few of the snowshoe companies invest in marketing directly to women but the Tubbs Snowshoe event "Romp to Stomp Out Breast Cancer" Series, is very popular focused on women. This year's event at Frisco Nordic Center in Colorado was attended by more than a thousand people! The series, which has been hosted at sites across North America has raised funds and awareness since 2003 bringing in more than $2.8 million for the fight for a cancer cure. When it is time to go skiing or snowboarding it only takes me a few minutes to get out the door. Of course, it takes some time to dress with base layer, selected socks, and top (ski shirt) and bottom (ski pants). I admit that it may be a bit obsessive to organize a "get away" bag of accessories; but the next step to get on the snow quickly entails reaching into my oversized bag that is in my living room to get the accessories needed. Additional hand and toe warmer packs and sun cream. Obviously, skiers who use waxable skis have an assortment of waxing paraphernalia. I use only waxless skis and only occasionally hot wax my ski bases, so I keep my waxing items in a separate bag in the garage. 1 small accessory bag that includes an extra stomp pad, 5 different replacement binding straps, spare boot laces, 2 runaway straps, bag with various binding screws and washers; chunk of hard wax, tin of paste wax, and antifog lens cleaner in rub-on and spray versions. The value of this preparedness bag is untold. Within the bag, the gloves are kept clipped together so it is easy to find a pair when needed. When getting ready for a ski trip near or far, the bag can be thrown in the car and that eliminates the need to worry about remembering any accessories. My daughter has followed my lead and created her own accessories bag. This winter when she was on college break, we were able to get out the door in less than 10 minutes from the time that we agreed to go snowboarding. And that includes checking the ski area website for conditions and the trail/lift report. When going on nearby ski outings, I often will do a test ski on the short trails from my driveway to decide about the temperature and snow conditions. Afterward, I can easily dip into the bag to change any of the accessories that I need. Next is selecting the skis or snowboard, getting into the car, and away I go. Living so close to xc ski trails and alpine ski areas is indeed a blessing, but being organized makes it so easy to focus on what counts, which is getting outdoors and on to the snow. Wearable Computers – Has the Time Come? Recently, there was news in the business world that the projected sales of wearable computers would reach 585 million units and billions of dollars within a few years. These computers include various sensors or displays worn on or placed in the body that perform activity tracking. You've probably seen wristbands and smartwatches. Is it over-hype or will sales skyrocket similar to the IPhone or GoPro camera? Will consumer attitudes and adoption rates drive and accelerate this market segment? Wearable technology information was featured in an InsideOutdoor Magazine article including survey feedback, the current situation, and the future of wearable computers. The early applications of wearable technology serve active and fitness-minded consumers. Wrist-worn devices can monitor and communicate information about motion, sleep, location, heart rate, and other body functions or health metrics such as steps taken, calories burned, etc. Concepts such as "fitness optimization" and the "quantified self" are currently chic and in 2013 there were nearly 5 million activity tracker units sold. Venture capital for biosensing wearables multiplied ten times between 2011 ($20 million) and 2013 ($229 million). It was cited that 10 million activity trackers were to be shipped in 2014 along with 7 million smart watches. Companies that are already in store display cases include Nike, Fuelband, and FitBitForce…but in short time watch for a wearable tech tsunami led by Apple, Samsung, Google, and others with their smart watches, glasses, and so on. The surveys show that 10% of Americans are strong candidates for early adoption of this technology. There are statistics showing those who are interested desire geo-tracking, fitness cues, goals, rewards, and the ability to share or compete with a group. Among American adults, 46% are at least a little interested, while 53% are not at all interested in wearables. Many people can not envision any benefit of wearables or view it as just another fad. Many people are currently uninformed about wearables and don't understand the need for such technology. About 17% will consider wearables when the price drops and the "bugs" have been worked out and 19% say they will never buy a wearable device. Interest is strongest among younger consumers but most want the technology to meet their needs better or replace technology they already use. Research about smart watches regarding gender showed men who are generally more gizmo-friendly (52%) are more likely than women 40% to be a little interested. Factors for adoption and utilization for any products include quality, fit, utility, aesthetics, out-of-the box ease, etc. Outdoor recreation has already applied wearable tech to things such as insulation, moisture management and anti-odor, insect deterrent, and sunscreen. But we'll see touch-button materials to operate portable devices, solar panel materials to charge devices, monitors for concussions, and the delivery of various analytics for performance optimization (ski turns, paddle stroke, golf swing, etc.). Applications with apparel, for health and training needs, and protective sports gear are only the beginning. Frankly, the options for wearable technology extend beyond activity trackers and biosensors and currently the use of wearable technology is just beyond our imagination. Swix, a Norwegian manufacturer of ski wax, poles, and ski wear joined with ski company Fischer to create an educational retail environment with Gorham Bike & Ski Shop where skiers visiting Jackson Ski Touring Center in NH can experience for themselves the latest skiing innovations from skis to ski wax and tuning techniques. Skiers can view and compare an extensive range of product lines to feel confident in their purchase decisions, share feedback with the manufacturers and maximize the performance of all their gear both new and what they already own. Almost the complete line of Fischer skis, boots, and poles will be showcased in the shop that attracts thousands of cross country ski aficionados all winter long. The two companies will provide additional training to the Gorham Bike & Ski Shop staff and there are demo days for skis and roller skis, plus ski waxing and race tuning sessions. The retailer also features machine flex testing, which mean that each ski is individually evaluated and marked with its particular flex pattern to match to a heavier or more powerful skier to perform with a more subtle touch. Jackson Ski Touring is a community based nonprofit corporation chartered to maintain cross country and snowshoe trails in and around Jackson village that has been in operation for 39 years. Situated in the White Mountains, it is a wonderful match of a quintessential New England with the white steeple church and wood covered bridge married to cross country skiing. Nordic walking (or ski walking) is taking off and the Human Kinetics book entitled Nordic Walking for Total Fitness by Suzanne Nottingham and Alexandra Jurasin has got it covered. For those who are unfamiliar, Nordic walking is a fitness activity that combines walking with specially designed poles to engage the upper body muscles. Trekking (hiking with poles) and Nordic walking are two different activities that use very different poles and techniques. It may sound silly, but perhaps "walking is not just walking." The pole angle, weight, grip, and straps are different between the aforementioned modes of walking. The Nordic walking pole is designed to allow your hands to relax in order to target the larger wrapping muscles of the back. But using poles of any kind automatically stimulates your spine and all of the muscles around it, even with inefficient technique. When walking, the key postural muscles of the core and upper body are engaged. Nordic Walking for Total Fitness outlines the health and fitness benefits and the enhancement of body posture that result from the activity. Equipment including poles, shoes, apparel, pedometers, and heart rate monitors are covered. I've been a Nordic Walker for a few years and found many of the claimed attributes in the book regarding posture and exercise to be true. I've always been in search of a way to decrease the amount of time spent exercising, so I was sold when I heard that using the poles increases caloric burning by 40 percent. Being a cross country skier, it is easy to quickly master Nordic walking. After a summer of Nordic walking, I noticed a marked improvement in my cross country ski poling in terms of strength and timing. It seemed that I increased the amount of forward momentum that was attributable to poling and I was able to pole stronger and longer when skiing. Nordic Walking for Total Fitness provides a foundation for anyone, ranging from those just looking for an activity to lose weight to health aficionados interested in taking it to higher levels of fitness. Nordic Walking for Total Fitness is available for $19.95 plus shipping from Human Kinetics at www.humankinetics.com or call 217-351-5076.